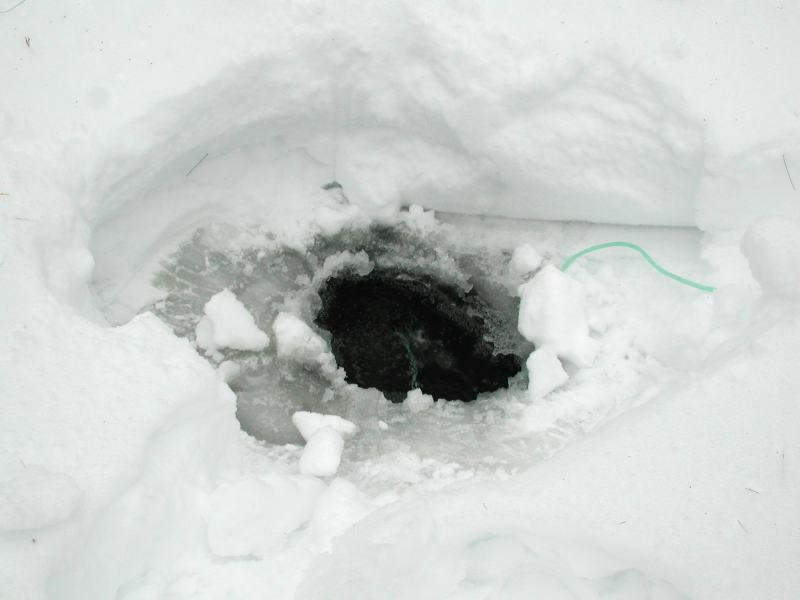 We added an air pump and and airstone to the bottom pond when the weather turned cold. 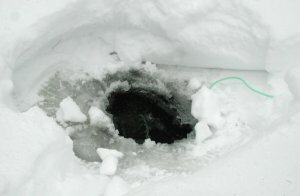 The general idea is to keep a hole open in the ice so that any noxious gases from decaying plant matter can escape. However, the pipe that runs from the air pump to the airstone tends to get blocked by ice (presumably from condensing moisture). At this point the ice freezes over and hot water needs to be applied. Interestingly enough, the water temperature in the pond rises when the air stops bubbling. The cause is (I think) that when the air is bubbling, the water is mixed (albeit very slowly). Thus the heat input from the ground doesn't get a chance to heat up a layer of water as the water is always being circulated in contact with the surface ice. When the air stops, then a layer of warmer water is formed at the bottom. I realize that this seems weird -- but you can check out these pond temperature graphs. On the evening of the 5th feb, the big storm came through and dumped 14 inches of snow on the pond. This bunged up the hole and added (I suspect) enough moisture to get the pipe to clog up. On the morning of the 8th, I went and applied hot water to the air pipe to clear out the ice. You can see the dramatic temperature drop as the water begins to circulate. It is unclear what the sensor calibration error is -- it may be that there is enough dissolved stuff in the pond that it doesn't freeze at 32.0F any more! For 2001, I added a pump and airstone for the top pond. Why? We had enough baby fish and frogs in the pond, and they were too difficult to trap and move to the bottom pond. In 2000, we scooped the babies out and got really cold doing it. This year, a new airstone. It turns out that the single pump (an old Tetra Luft) could not really drive both airstones, so I was relieved that I had bought the Tetra DW96 as well. I took the waterfall pump out (it is above ground, but below the water level), but the knife shutoff valve that prevents water from the bottom pond filling up the pump house seems to leak. After spending some time in Home Depot, I found a nifty plug that I could insert into the end of the 2inch pipe that was left after I removed the pump. You just insert it into the pump, and then tighten up a wingnut to seal it. [I'll add the real name for it later.] Cost $2.67 - a bargain. I vacuumed out the filter so that it is now dry and somewhat clean. This should prevent any damage from freezing. Most of the plants were dropped to the bottom of the ponds, with some being brought into the basement where they sit (under water) in a large Rubbermaid tub. The bog plants are sitting in rather less water in another Rubbermaid container. The plants survived being in the basement last year, so I am hoping to repeat this success.